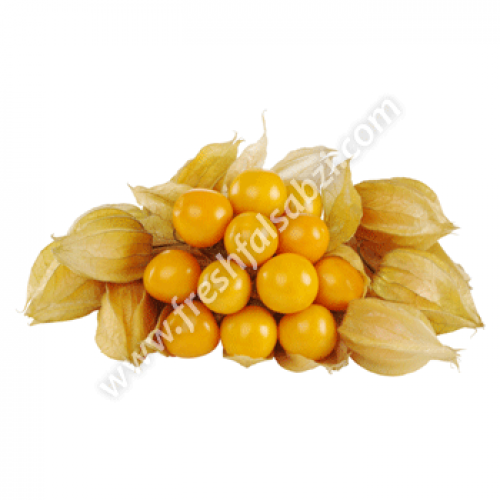 The fruit is a smooth berry, resembling a miniature, spherical, yellow tomato. Removed from its bladder-like calyx, it is about the size of a marble, about 1–2 cm in diameter. Like a tomato, it contains numerous small s. It is bright yellow to orange in color, and it is sweet when ripe, with a characteristic, mildly tart flavor, making it ideal for snacks or jams It is relished in salads and fruit salads, sometimes combined with avocado. Also, because of the fruit's decorative appearance, it is popular in restaurants as an exotic garnish for desserts.